You should make a list of your talents. You may not know them yet, but you can begin now. Is it putting things and places in order? Is it writing a story? Is it planting things in a garden? Is it helping a needy person? Is it mending broken or torn things? The things that you find yourself effortlessly or spontaneously doing are indicative of a talent or talents. Write these down. Is it to explore the world? Is it to do deep sea fishing? Is it to build a sky scraper? Is it to lead people? Is it to follow a leader and make him great? Desires, strong desires, enduring desires may indicate the presence of a talent or talents. The things that you day-dream about may indicate a talent or the domain of a talent or talents. Fourthly, what do you dream very frequently about? It could be indicative of what God wants you to do or to become. Consequently, it could be indicative of a talent or a domain in which a talent is found. Fifthly, what do you do exceptionally well with or without effort? This is strongly indicative of a talent. Sixthly, in what do you easily outclass the others with little or no effort? This is strongly indicative of a talent of significant magnitude. Seventhly, what do others often admire you when you do it? That again would strongly indicate the presence of a talent of signification magnitude. Eighthly, ask your friends, your parents your closest associates, your spiritual authority, and anyone who knows you what they think your talent or talents are. Ninthly, pray to the Lord. Fast and pray asking Him to show you what your talent or talents are. 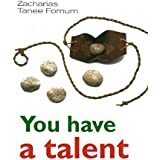 Tenthly, look at the list of talents in the chapter, “Examples of Talents” and see if any of those cited there are yours. things will increasingly become clearer to you and to others as to what your talents are. When that is done you will have reached a very important stage in your life.